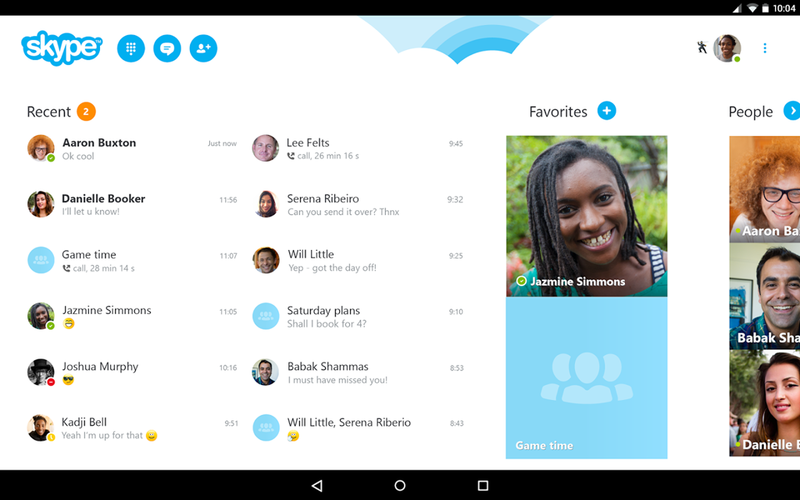 Microsoft has released an update for Skype android app versioned Skype 7.0 which includes a brand new design for tablet devices (Material design inspired UI). Here’s the release notes from the Skype blog about the Skype 7.0 features. We’ve redesigned the tablet UI from the ground up, bringing a number of material design inspired elements. The new floating action button (FAB) makes it faster to send messages and start voice and video calls with friends or groups—all from the main screen of the app. The FAB changes your Skype experience dynamically to give you quick access to important features like messaging, voice, video calls and Skype bots. Multitasking features – the new tablet design makes it easier to multitask as it comes with a multi-pane view when in landscape orientation. Simply flip your device and you’ll be able to send messages, files and check your latest conversations while on a video or voice call. Powerful search – Skype 7.0 also brings our improved universal search to Android tablets, making it easier and quicker to find contacts, chats, groups and Skype bots, right from the main screen of the app. Invite your friends to Skype – now, when you sign in to Skype you will see all of your device’s address book contacts displayed in your Skype contact list. If they aren’t already using Skype, it’s now easier than ever to invite them. All you need to do is click the “invite” button next to their name and they will receive a message with all the info they need to get started.